Duke Energy issued the following announcement on March 15. Data (page 54) from the U.S. Energy Information Administration (EIA) confirmed North Carolina's 36 percent growth, which significantly outpaced other leading solar states. By comparison, California's annual solar production rose 15 percent; Arizona's and Nevada'soutputs each grew 10 percent in 2018. At year-end 2018, EIA reported North Carolina produced 7.2 million megawatt-hours of solar generation – enough to power more than 600,000 homes. North Carolinas was third in the nation for connecting new solar projects in 2018. Most solar energy produced in North Carolina is owned or purchased by Duke Energy. With 4 million customers in North Carolina and South Carolina, Duke Energy continues to build a smarter energy future. In the Carolinas, more than half of the energy produced comes from carbon-free resources including nuclear, hydropower and solar. Since 2011, Duke Energy has shut down 30 coal-fired power plants in the Carolinas and will retire five additional coal-fired units in the next six years. Since 2005, the company has also reduced carbon dioxide emissions by 36 percent in the Carolinas, and projects a 53 percent reduction in the Carolinas by 2025. The company is also continuing to pursue battery storage, with a $500 millioninvestment slated over the next 10 years and projects already underway in the Asheville area. Duke Energy owns and operates more than 35 solar facilities in North Carolinaand has invested more than $1 billion in renewable energy in the state. The company also continues to introduce new solar programs for different types of customers. The company's $62 millionsolar rebate program for residential, commercial and nonprofit customers in North Carolina has helped 3,000 customers go solar in its first two years. Duke Energy will continue offering these rebates over the next three years. In 2018, Duke Energy connected more than 500 megawatts (MW) of new solar capacity – enough to power about 100,000 homes at peak output. Duke Energy also launched a competitive bidding process for new solar capacity. The process, being overseen by an independent administrator, seeks to add 680 MW of new solar capacity in 2019 – enough to power about 125,000 homes at peak output. This will ensure the best and most cost-effective projects are built to benefit customers in the Carolinas. Winning projects are expected to be named this spring. In 2018, Duke Energy also became one of the few companies in the Carolinas to offer solar leasing to commercial customers. A subsidiary of Duke Energy will build, own and operate on-site solar facilities that will allow customers in North Carolina and South Carolina to access renewable energy without paying a large upfront investment. For industrial customers, the company recently received the order from the North Carolina Utilities Commission for its Green Source Advantage program in North Carolina. 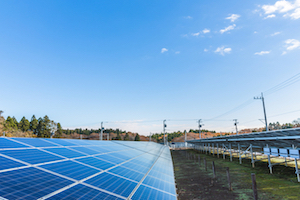 This "green tariff" provides customers the flexibility to negotiate directly with solar developers to add more renewable energy to the grid, with no cost to other customer classes. Want to get notified whenever we write about Duke Energy ? Next time we write about Duke Energy, we'll email you a link to the story. You may edit your settings or unsubscribe at any time.